DNA Diagnostics Center, Inc. is working on a piece of technology that would allow gamers to import their genetic information into a video game. "For competitive reasons, DDC can not elaborate at this time" - Dave Silver, vice president of marketing at DDC. Its hard to know what Mr. Silver means by "competitive reasons," but they're obviously worried about another company thieving their tech. Though, I can't imagine that many other companies think that genetic testing will become the next big video game technology. Update: The Escapist's Senior Editor for Science & Tech, CJ Miozzi, was able to get in touch with Alexei Gorelik, a biochemist at Canada's McGill University. Gorelik isn't involved with Helix Profile, but he was able to shed some light on the project. Gorelik explained that DNA tests typically produce results that fall into two different categories: "1) general traits like height, skin color, hair color etc... and 2) medical information like predisposition to diseases." "If they use it for the first purpose, maybe it could be, like, an automatic character creation thing," Gorelik said. "If they use it for the second, they could have microtransactions, like 'pay us $1.99 and find out which one of these four degenerative diseases you will get!'" Hopefully EA never gets its hands on this system. Gorelik was obviously joking about Helix Profile's potential for disease-related microtransactions, but it does underline the fact that aimlessly feeding our genetic information into a computer that doesn't belong to a medical institution is probably a bad idea. Original Story:A DNA testing company from Fairfield, Ohio is developing a process that would further blur the line between virtual reality and real life. 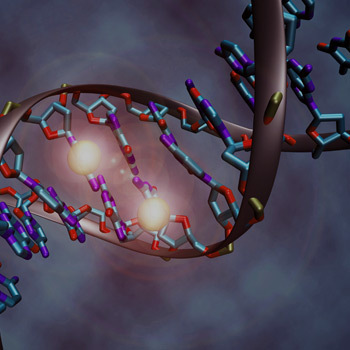 The technology, called "Helix Profile," will use genetic testing to analyze player DNA. Once a genetic profile has been created, the data could then be imported into a video game. Very little is currently known about Helix Profile. And the company behind the process, DNA Diagnostics Center, Inc., declined our invitation to comment. However, the trademark application is somewhat self explanatory: "Genetic testing for entertainment purposes to profile a person's traits for use in an electronic interface such as a video game"
I can't imagine that this kind of thing would be terribly popular with developers or gamers. Players would either have to purchase a piece of hardware that can analyze genetic data or send their saliva/blood samples to a testing center and wait several days for the results. Either way, it seems like an awfully complicated way to skip the character creation screen. It's also worth noting that DNA Diagnostics Center, Inc. might not have any intention to bring Helix Profile into the market. The company could simply be protecting possible uses for its existing technology or showing off for investors. However, DDC is best known for its consumer-level genetic testing--the kind of thing that Maury Povich is always using to determine paternity. So, Helix Profile isn't terribly far from the company's current business model. Source: United States Patent and Trademark Office, DNA Diagnostics Center, Inc.